We are pleased to announce a new release of the popular Application Pool Manager. 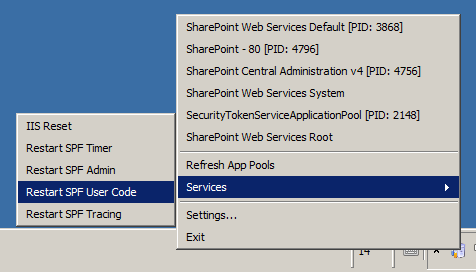 This version (v3) has been produced to support SharePoint 2010. We don’t have much in the way of fancy new features in this release, but we do have some good ideas for a future release around April and are always keen on other ideas we could incorporate. 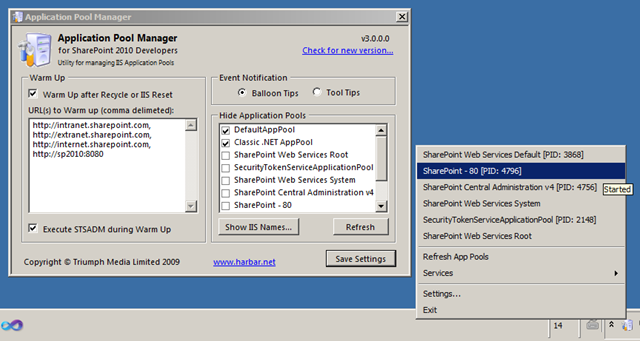 The most important thing about this release is that it is targeted at SharePoint 2010 only. As such it only supports IIS7. This has allowed us to remove all of the legacy IIS6 code and the shims necessary to support both versions of the web server. This means (hopefully!) smaller and more efficient operation. So just to be clear v3 runs on IIS 7 only (Windows Vista, Windows 7, Windows Server 2008 or R2). For SharePoint 2007 development, you should continue to run version 2, which of course also supports Windows Server 2003 (IIS6). Hopefully you will find this new version useful in your SharePoint 2010 development, you can download the application over on the main APM Download page.